Babies are popping out everywhere. We're up to 10 on the farm as of the last 48 hours. More are expected and we have one in the maternity stall, thinking she'll be next. Some other doe could prove me wrong however and I could have a surprise waiting for me. 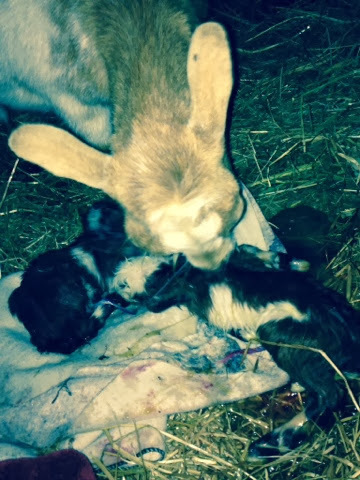 Last night Cheyenne had a boy and a girl, and we named them Thomas and Miranda. I took this picture when they were still wet and Mama Cheyenne was cleaning them up. Miranda is on the left and bigger boy Thomas is on the right. I'll post more baby pictures this weekend when we get caught up.